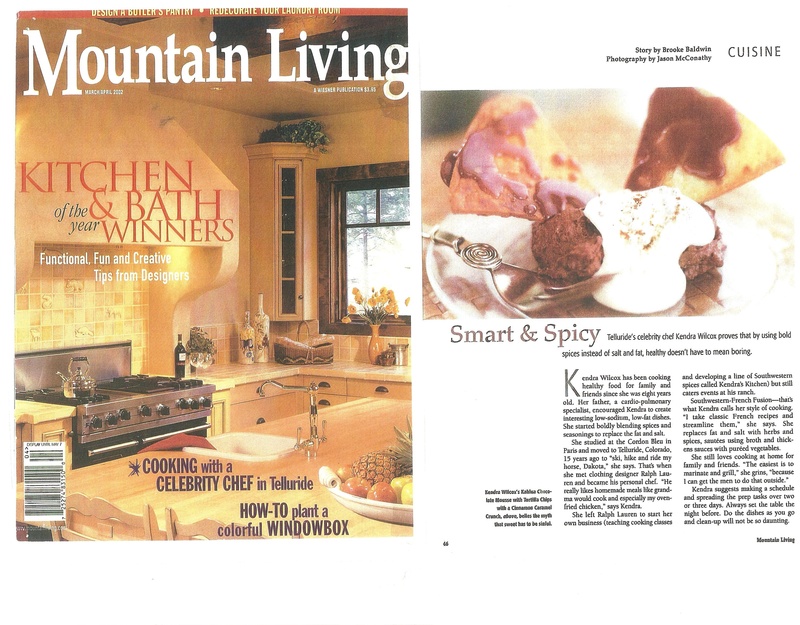 Kendra's Kitchen® Rub & SW Seasoning is Available @ The Market @ Mt. Village, Telluride, Colorado = Your local affordable grocery store in the Mt. Village. Visit The Kitchen's Garden at Farmer's Market in Meeker, NW Colorado, Hwy 13 at the Stage Stop Meat & Deli Shop, Every Wednesdays July 4th thru Harvest Season = Mid October 2012. Fresh Herbs by the Cut, Tomatoes & Chiles, Kendra's Kitchen Rub & SW Seasoning®, Laminated Recipe Cards and Cool Culinary Gadgets are available for purchase. Ask Kendra for her Chef Created Dinners that are simple, quick & nutritious and she customize a recipe for You & Your Family. She will supply you with the recipe, the fresh herb and Kendra's Kitchen Seasoning. Viola - Dinner is Done! Please telephone and email order. 800.894.9086 or 970.728.7759. ADVANCE RESERVATIONS PLEASE. DIRECT PAY ONLY. We Accept MC & Visa and will be accepting American Express in the near future. Grand Tasting, Saturday, August 13 5:30 - 8:00 p.m. at the Plazas of Mt. Village/Telluride, CO. Chef Kendra & Assistant are available for Personal Chef Services & Estate Holiday Decorating for Christmas Season 2011. Will travel to vacation destination. Payment Terms: We accept MC & Visa, Company checks & personal direct deposits. The Natural Food product line includes Telluride's Own Rub & SW Seasoning ® and Telluride's Own BBQ Sauce. The Rub & SW Seasoning is very low in sodium and has no msg and is made with mineral enriched muramoto sea salt. One may use it as a substitute for salt & pepper, make the simple sauce or mix with sour cream & nonfat plain yogurt or mayonnaise and use as a base to salads. The Simple Sauce formula consists of a protein, a cream, a fresh herb, shallots & Kendra's Kitchen Seasoning; deglace with red or white wine. The BBQ Sauce has no fat, no cholesterol and is low in carbohydrates, sodium & sugar and it is preserved with seaweed. The BBQ Sauce may be us as a marinade when combined with beer or wine. Create a quick healthy gourmet sauce that is delicious over various proteins. Sauté with red wine, shallots, mélange of peppercorns and fresh thyme or sage and pour over chicken, pork, beef, game or tempeh. One may also use it as a base to pot roast; the recipe is on the label. Or simply use as a classic BBQ Sauce. Combine both products for the ultimate Southwestern Style BBQ, a chile pepper BBQ. Chef Kendra Wilcox uses her healthy gourmet food products to create nutritious yet tasteful dishes. She uses organic produce, hormone free proteins, no msg, no preservatives and the flavors of the freshest ingredients that enhances the diner's palate instead of butter & salt. After 20 years, the company now consists of a healthy gourmet food product line, weddings, catering, cooking classes, fundraising and personal chef services. Bon Apetit & to healthier dining! All available Nightly, Weekly or Monthly. Peaceful Walk in Ski/Home condo in the Mt. Village. The Ag House = vacationing or relocating families, sport enthusiasts and Hunters, complete with a game processing room & RV Hook Up.